The NWS Cooperative Observer Program is truly the national weather observing network of, by, and for the people. More than 8,700 volunteers take observations where they live, work, and play. The NWS depends on these volunteer observers, committed to taking observations at the same location for 10 or more years, to report daily weather and climate information using the phone or internet. 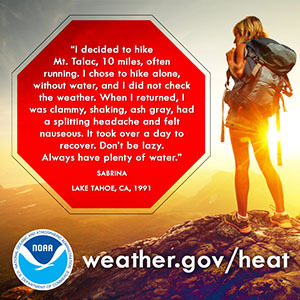 NWS provides the training, equipment, and maintenance — you provide daily data! Your observations support warnings, forecasts, and help build a long-term weather history for an area. This program has existed since 1890 and is one of the few programs that measures snowfall and its water equivalent. Help keep your community safe by volunteering to become a trained severe storm spotter for the NWS. Storm spotters report hazardous weather to the NWS, which aids the warning process. Volunteers are trained by NWS meteorologists to identify and describe severe local storms, including severe thunderstorms, tornadoes, and floods. Interested? Visit the NWS SKYWARN website, then contact your local NWS office to find out about free local and online training. Many offices require a 2 hour training. The Weather-Ready Nation Ambassador™ initiative is the National Oceanic and Atmospheric Administration’s (NOAA) effort to formally recognize our partners who are improving the nation’s readiness, responsiveness, and overall resilience against extreme weather, water, and climate events. As a WRN Ambassador, partners commit to working with NOAA and other Ambassadors to achieve this goal. Please note that only organizations can be WRN Ambassadors. The Community Collaborative Rain, Hail, and Snow Network (CoCoRaHS) is a network of volunteer observers who measure precipitation from their backyard. Any age can volunteer. CoCoRaHS sells low cost equipment to help volunteers get started. Observers enter their observations online. This data is used by a wide variety of users, ranging from meteorologists and hydrologists to insurance adjusters and engineers. Have you been a victim of dangerous weather hazards? NWS encourages you to tell us your story by emailing melody.magnus@noaa.gov. If possible, also let us know the town and state you were in and the year the event took place. We share survivor stories on our website and social media platforms to help inform others about the dangers of hazardous weather. Please note that NWS has permission to use your story upon submission. mPING (Meteorological Phenomena Identification Near the Ground project). Weird name, cool app! Users can report the type of precipitation they are experiencing. No need to measure! Use the free mobile app to send reports anonymously. Reports are automatically recorded into a database to improve weather computer models. The information is even used by road maintenance operations and the aviation industry to identify icy areas.